Luckily all of this has been researched in great detail and the last five generally should not be varied at all. To brew a perfect double espresso you should use water at 92-94 °C and a pressure of 9 bar. During an extraction time of 25-27 seconds you should get 60 mL of espresso – no more, no less! 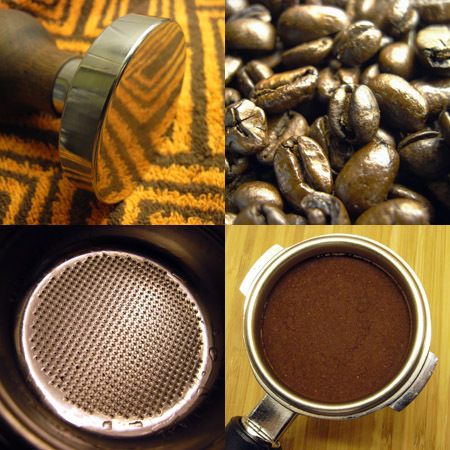 To provide enough back pressure you need to tamp the ground coffee relatively hard in the filterbasket. A pressure of 10-15 kg is recommended. As you can see all these parameters are fixed. So the only things left for the barista to vary is the grinding, the dose and of course the choice of coffee beans (including roasting). Since the recommended amount of coffe for a double espresso is 14-16 grams (some extend the range to 12-18 g), you’re basically left with grinding and the choice of coffee beans. Sounds simple, but there’s a lot that can go wrong. I’ll come back to all of this in part II. The espresso should neither be too bitter nor too acidic. And it should have a nice and stable crema. There is one family whose name is forever linked to espresso – the Illy’s. The above quote is from Ernesto Illy’s article “The complexity of Coffee” which appeared in Scientific American, June 2002 (previously available from illyusa.com, now available through the internet archive – it’s highly recommended!). The illy company was founded by Francesco Illy (1892–1956) in 1933. In 1935 he invented the precursor to espresso machines as we know them today. His son Ernesto Illy (1925-2008) studied food chemistry and worked with illy for his entire career. Francesco’s grandson Andrea Illy (1964-), also a chemist by training, currently acts as chairman of the board. “Espresso is a miracle of chemistry in a cup,” says Andrea Illy (this is as close to pure molecular gastronomy as you will ever get!). The (scientifically) interested reader will probably enjoy the definitive textbook on the subject: “Espresso Coffee: The science of Quality” which Andrea Illy has co-edited. The more artistically minded might prefer “Illy Collection: A Decade of Artist Cups”. “Discovering La Dolce Vita in a Cup” (NY Times interview with Ernesto Illy from 2001). There is also a video interview with Ernesto Illy available on DVD, “The Complete Dr. Illy Milan Interview”. Andrea Illy talked about “The Science of Coffee” at the New York Academy of Sciences (podcast) and was also interviewed by CoffeeGeek. 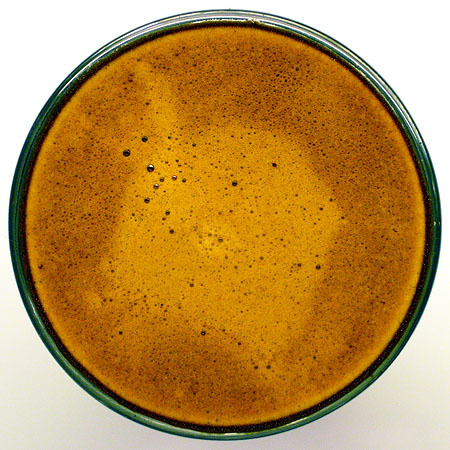 When it comes to preparation of espresso (which I will digg into in part II), “Espresso Coffee: Professional Techniques” by David C. Schomer is the standard textbook most people refer to, in addition to the videos “Caffe Latte Art” and “Techniques of the Barista”. Schomer developed Espresso Vivace with Geneva Sullivan and operates espresso bars in Seattle. The homepage features an extensive archive with articles on espresso by David C. Schomer. Previous posts in the extraction series: water, ethanol and oil. In Italy when you go to a bar you don’t even ask for an “Espresso”, you simply say “a coffe”. It’s taken for granted that it is an espresso. Then you have many variations: “macchiato” (with milk foam), “ristretto” (with just the first half of the dripping, “lungo” you extend the water dripping” and so on..
Schomer’s writing was good and pushed things forward – but I think technique has moved past him. Scott Rao’s book, for example, is a bit more of an open minded approach to recipe variation and understanding the variables therein. I was a huge fan of Ernesto Illy, I enjoyed his writing and his attitude – though he would sneak perhaps too much romance into his writings. His books are interesting though I am not entirely sold on the direction his son is taking the company. The Silvia is a good choice of espresso machine – but more importantly: which grinder? If you ever want some coffee we’ll happily send you over a little espresso to play with. I’ve been interested in learning more about the science of coffee, but frankly the sheer volume of learning out there was a bit intimidating! Thanks for writing these articles. I have the privilege of living in Seattle where David Schomer’s espresso bars live (Vivace Coffee). I have to say, they consistently make the best espresso I’ve ever had. Unbelievably stable, creamy crema with a deeply caramelized flavor. I recommend any cafeophile who visits Seattle makes it a point to get there and have a doppio. Hugh: There are actually a whole bunch of scientific articles about coffee. Try searching with Google Scholar. Martin – Interesting article yet again. I too am intending to go with the Miss Sylvia. I hope that you are intending to PID control the machine like a true geek? Have you experienced the Clover machine or seen any data on it? I think it is basically a glorified cafetiere, albeit sophisticatedly improved upon, but it does seem to produce some good coffee. Would be interesting to compare the scientific benefits of this kind of “vacuum” extraction versus more traditional designs. I’ve seen the Clover at a coffee bar but never actually tasted the product. I’m not familiar with the “technology” or it’s features – will have to explore that further.